Today is the first post in my 10 Recipes 10 Weeks Series. 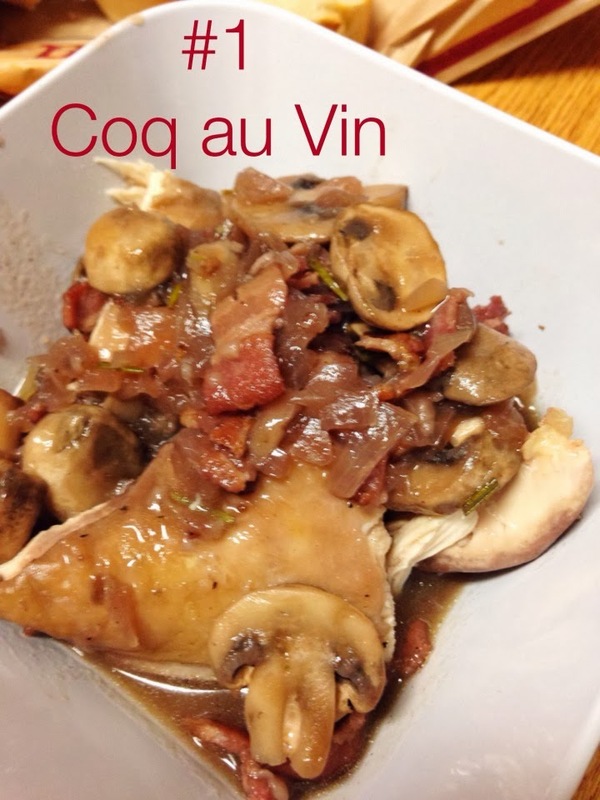 This French dish features le poulet (chicken), le vin (wine), les champignons (mushrooms), and l'oignon (onion). I've tasted this dish before and fell in love with how the chicken became infused with the flavor of the wine. 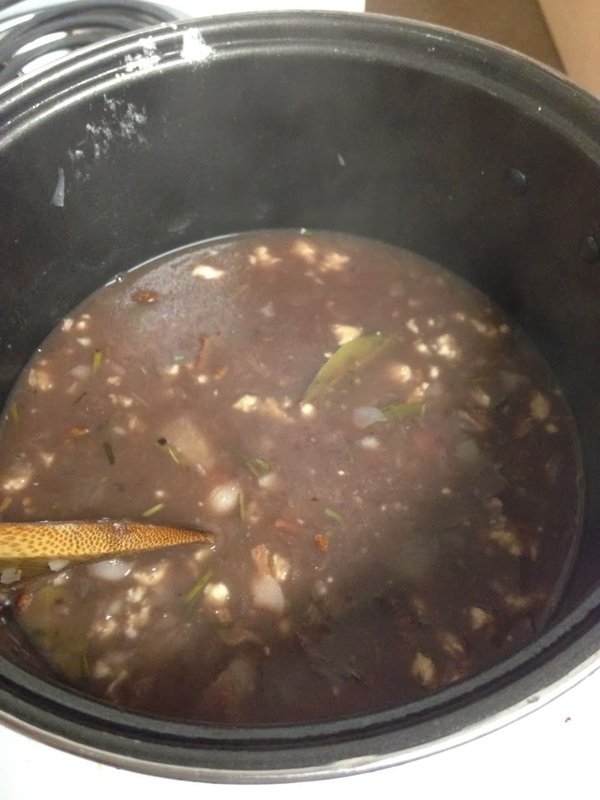 The rosemary, garlic, bacon, and bay leaves add depth to the flavor of the sauce as well. I've never tried it because it seemed super complicated. I found this simplified version from Jenna Weber and decided to make it for a good friend that recently got engaged. I have put my modified recipe at the end of the post. Tip: Don't wear a white shirt while making this dish. Step 1: Fry bacon in the bottom of the pot you will be using for the chicken. I don't have a dutch oven yet so any large pasta pot works. After its done, remove and place on paper towels. Leave bacon fat in pot. Step 2: Brown your chicken. 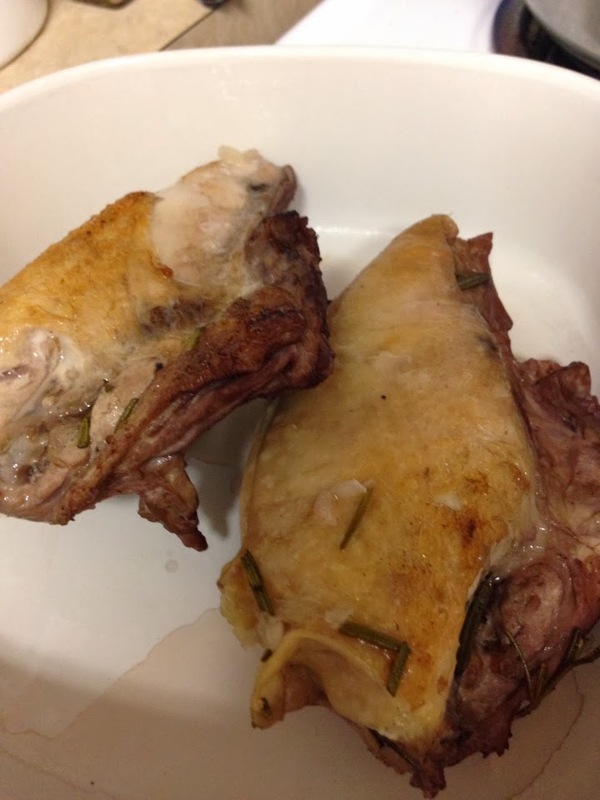 You need chicken with skin and I bought chicken with skin and the rib cage still attached. If you can find any option that doesn't have the bones, I would recommend that. Step 3: Add chopped onion, rosemary, bay leaves, and garlic. It starts to smell really good here. Step 4: Once you've cooked down the onions, add in chicken broth and wine. I'm pretty sure the chicken is supposed to be covered in the mixture. 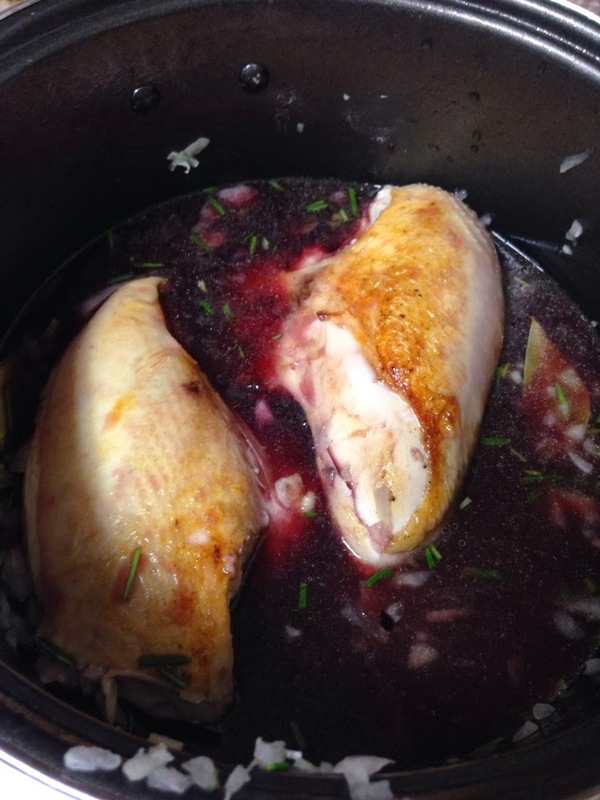 Next time I would add more wine and chicken broth so the whole chicken becomes that reddish purple after simmering (instead of just the bottom). Step 5: Bring to boil. Lower to simmer and then cover for 30 minutes. Step 6: Remove chicken and keep warm in the oven. Add in flour and butter. Stir to thicken the sauce. If you'll notice in the picture to the left, most of the white chunks are chunks of flour. It took a lot of stirring to break them up. Next time I would just incorporate a little bit at a time so it dissolves easier. Step 7: Mushrooms and bacon! 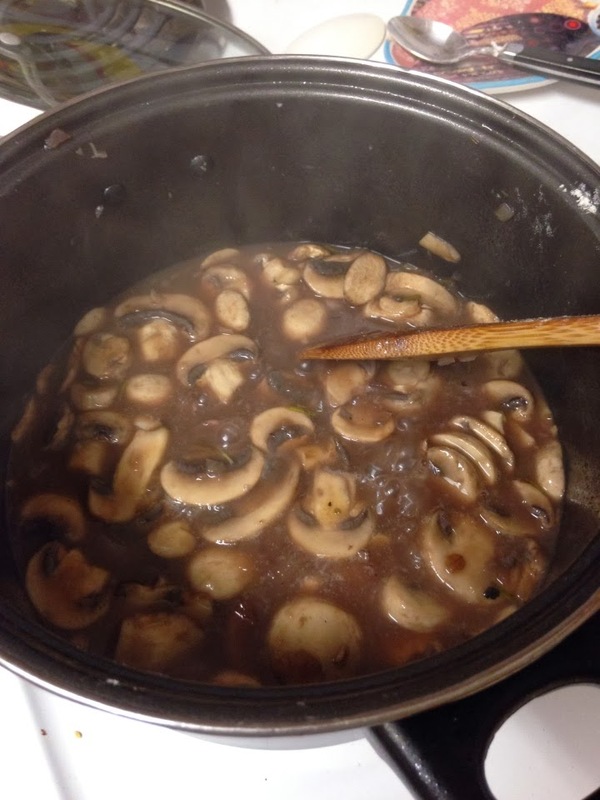 Cook the mushrooms in the sauce for about 10 minutes. 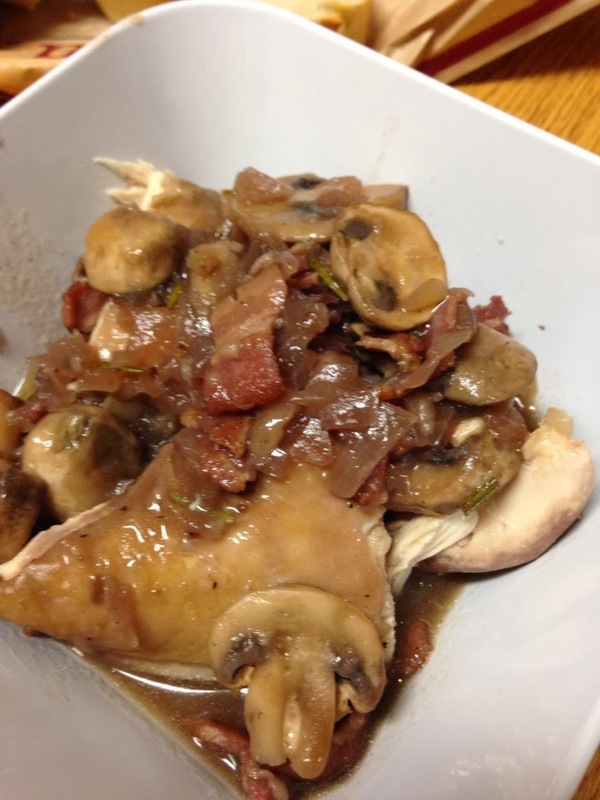 Step 8: Dinner was done before my guest arrived so I put the chicken back in to simmer in the new mushroom and bacon sauce. Step 9: I took off the bones and then served it in a bowl. I loved it with bread on the side so I could dip it in the sauce. Overall I really liked it. I halved the recipe because I'm usually only cooking for two people. Next time I would make sure to get chicken without the bones, cover the chicken in the sauce to simmer, and add in flour in small amounts. 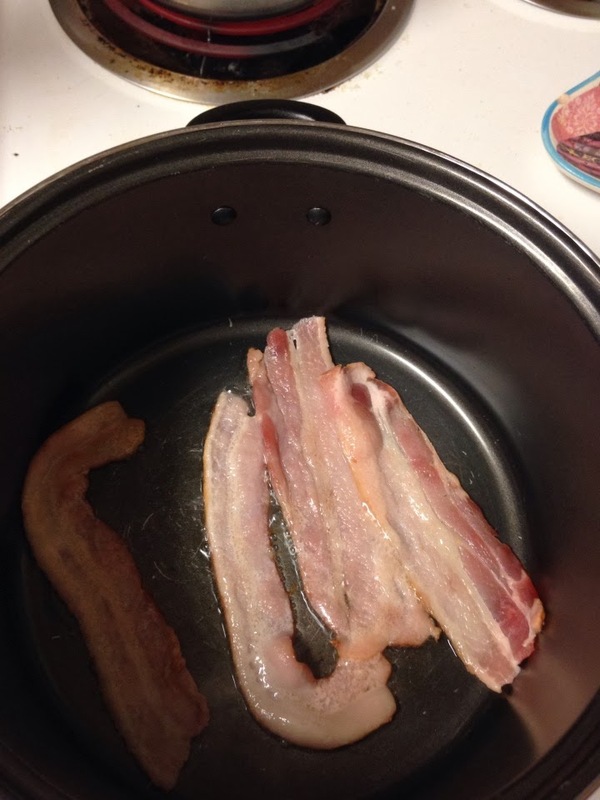 Fry bacon in large pot over medium heat. 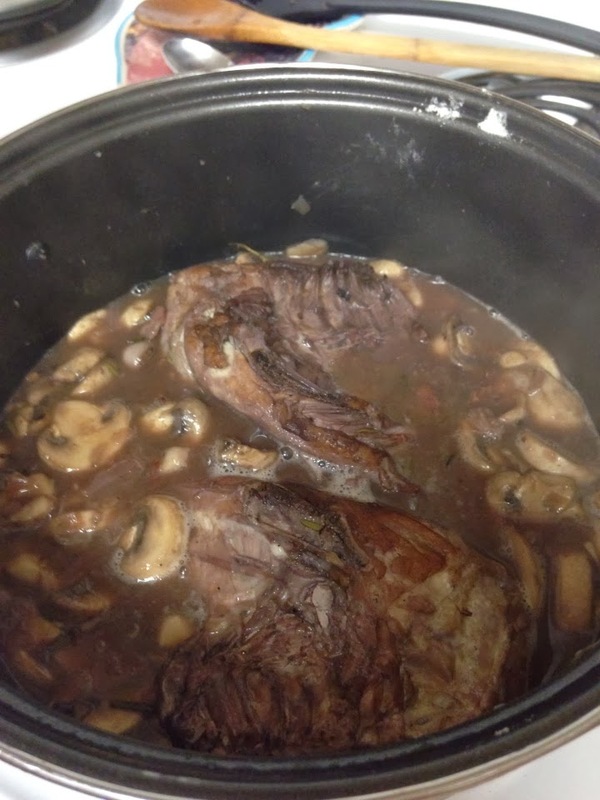 Once cooked through, remove on to paper towel and set aside. Leave bacon fat in pot. Turn heat to high. 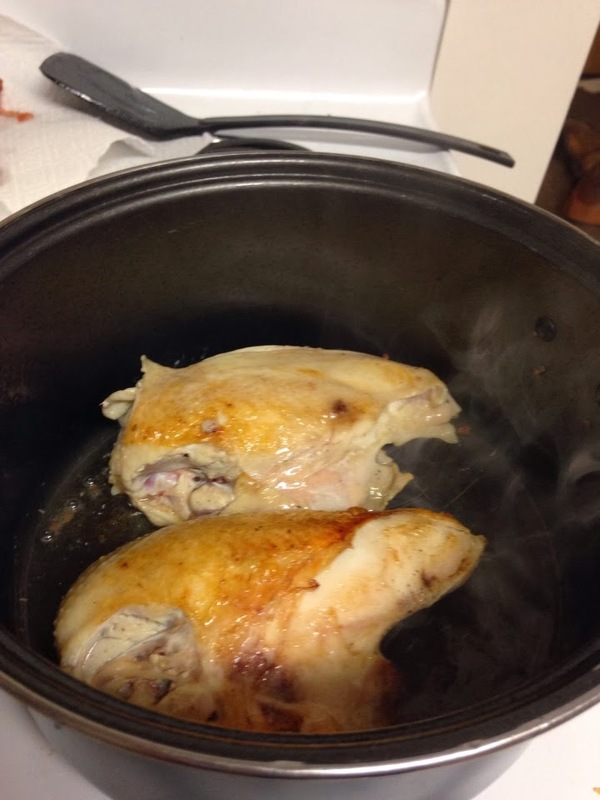 Dry chicken with paper towel and then brown chicken on both sides (5-8 minutes). Add onions, garlic, rosemary, and bay leaves to pot. Sauté until onions begin to soften. 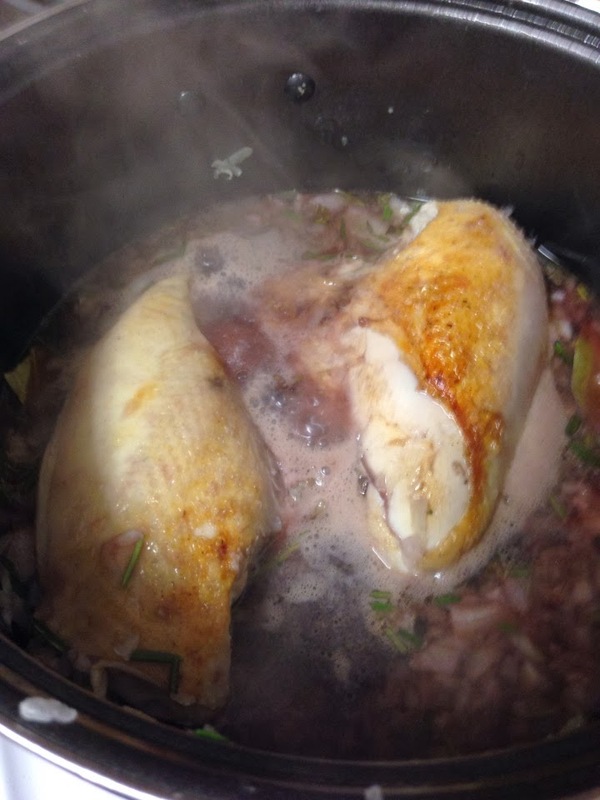 Add in equal parts of chicken broth and wine until you cover the chicken. Bring mixture to a boil. Once it starts to boil, bring down to a low simmer. Cover and let simmer for 30 minutes. During this time, preheat oven to 250 degrees and chop bacon. 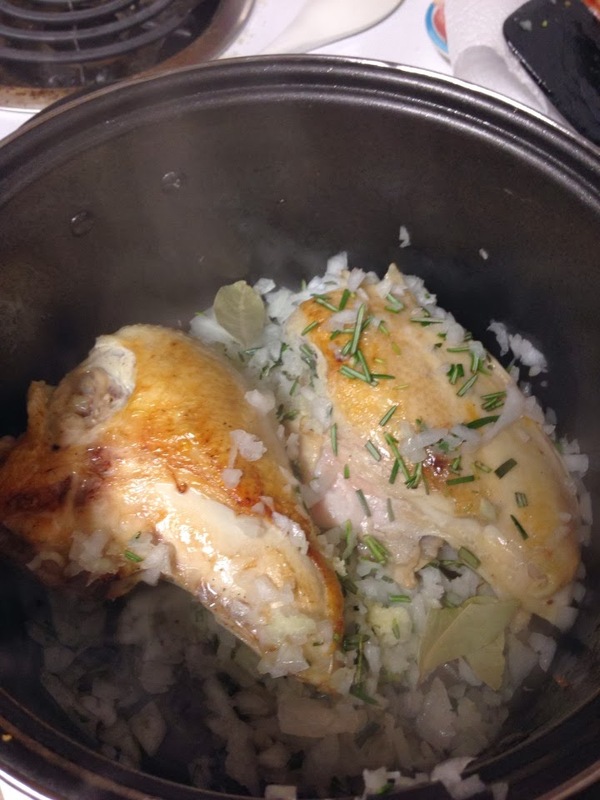 Once it is done simmering, carefully remove chicken to an oven safe dish and keep warm in oven. Add in the butter and flour to sauce. Bring back to a boil and stir constantly. It should begin to thicken. After flour has dissolved, add in the mushrooms and chopped bacon. Continue cooking for 10-12 minutes. Taste and add in any salt and pepper. Remove chicken from oven and serve with sauce.